According to statistics from the Health System Tracker prepared by the Peter Center on Healthcare and the Henry J. Kaiser Healthcare Foundation, in 2000, healthcare expenditures reached $1.4 trillion. By 2016, healthcare expenditures more than doubled to $3.3 trillion. The U.S. Department of Labor confirms that medical costs have increased by 48% during the last 10 years. “The keys to sustainable reduced medical cost are controlling utilization and targeting specialties. …This requires finding the right strategic partners and applying proprietary clinical intervention triggers that maximize the reduction in total loss costs to produce the optimal outcome,” the LexisNexis Workers Comp Law News article, 10 Myths and Facts About Workers’ Compensation, explains. In order to control utilization, the employer has to control the workers’ compensation process. 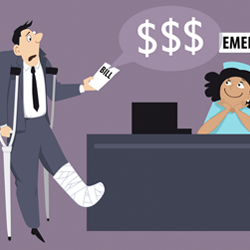 Companies need to implement policies and procedures directing the process immediately after an injury in order to be in control of employee claims. Companies with a tight post injury procedure dictate what happens from the moment an employee is injured, or a chronic condition is reported, to when he or she returns to work. Employers need to find the right strategic medical partners. Employers should carefully select the best medical facility to treat the injury or condition and direct injured employees there. For example, a sprain or strain does not warrant an emergency visit to the ER. A case of chronic osteoarthritis from wear-and-tear or age that has been a healthcare issue for months is not suddenly an emergency. All musculoskeletal injuries, such as sprains, strains, fractures, and chronic conditions, including arthritis and back pain, can and should be diagnosed and treated at Direct Orthopedic Care. At every location, DOC’s team includes orthopedic surgeons and orthopedic specialty-trained PAs. With DOC as a strategic partner, the employer and employee benefit from co-pay only cost, no facility fee and no double jeopardy with a referral to another provider. DOC is open 7-days-aweek with no appointment. Employees receive immediate care, which means faster recovery, less down time and an accelerated back-to-work schedule. During the workers’ compensation process, DOC is in frequent contact with the employer, employee and healthcare provider to monitor the employee’s healing and recovery progress to gauge when the employee will be able to begin to return to work. The goal is to “maximize the reduction in total loss costs to produce the optimal outcome,” which includes a healthy employee ready to work.